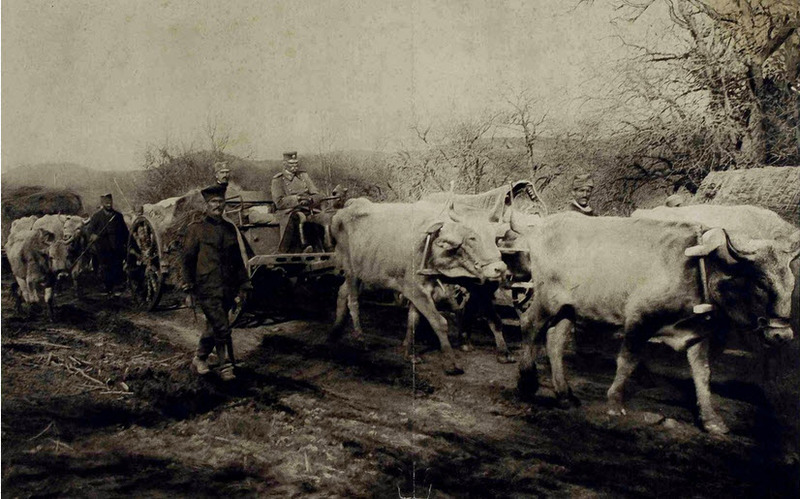 The elderly King of Serbia, Peter I, in a cart being pulled by four oxen, during the Serbian retreat. World War 1 started because of the conflict between Serbia and the Austro-Hungarian Empire. What would otherwise have been a small regional conflict, developed into a world wide bloodbath once the Great Powers aligned themselves with or against Serbia. At first the Serbs were completely overmatched and most of their country was occupied by the Central Powers. However the King and the remnant of his army managed to retreat to Greece and Albania, where, supported by the French and British, they were able to hang on and eventually regroup. This is a photo taken circa 1910, of a French coal woman whose job was to deliver sacks of coal to homes for heating and cooking. 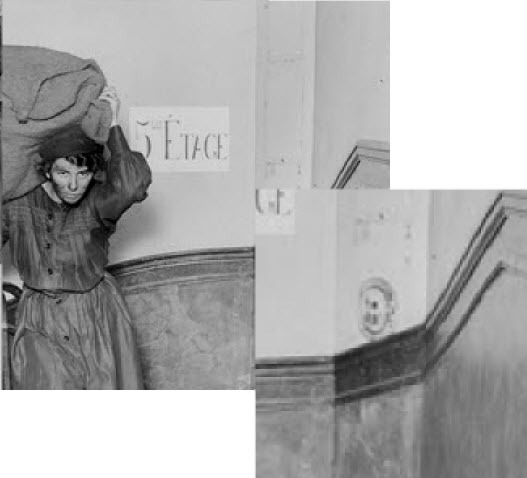 Note the sign behind the woman which reads “5eme Etage” — Fifth Floor. Given the French custom of naming the ground floor the first floor, this meant that the woman had carried that huge sack up four flights of stairs. 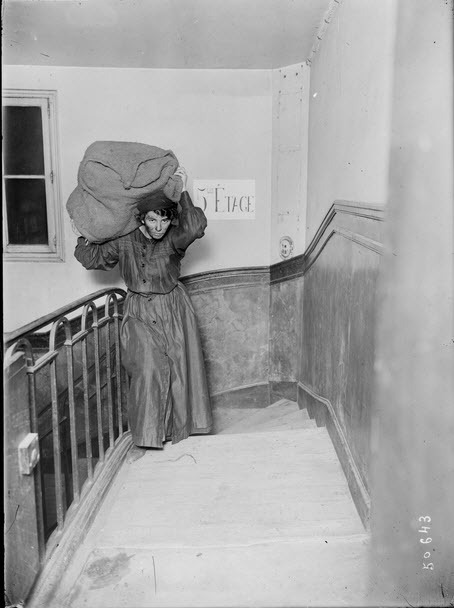 Who knows how many sacks she had to deliver each day, up how many flights of stairs. 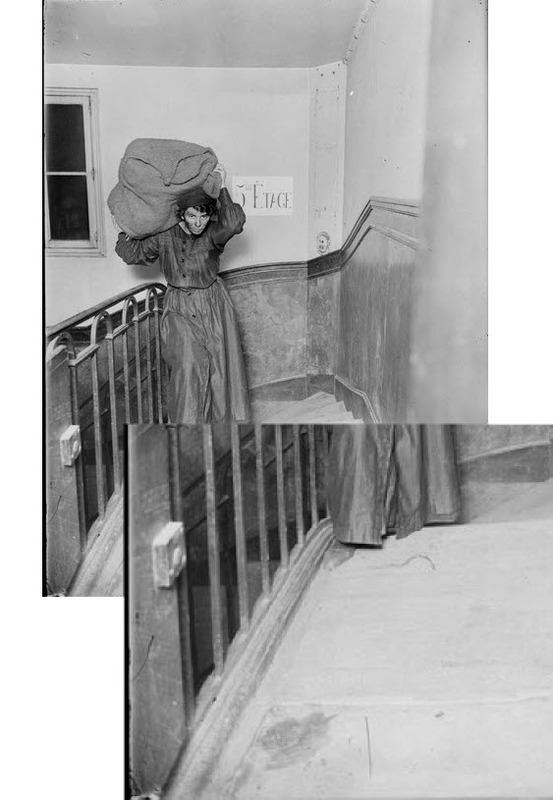 Focusing in on various sections of the photo can give us some interesting glimpses into the coal woman as well as French apartment life during that time period. In the picture below we have a closeup of the woman’s face, which is dirty from coal dust. Most likely she would come to suffer respiratory ailments from the dust that she inhaled day in and day out. 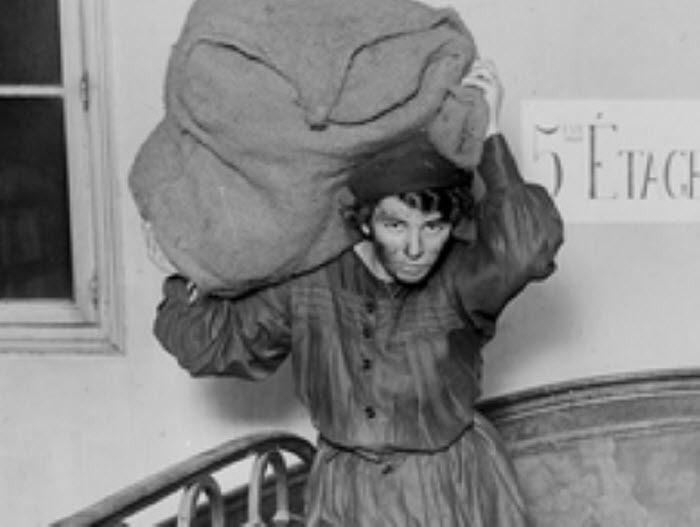 The huge coal sack is balanced on her shoulder and neck, and she is wearing a large dress; it must have been sweaty work climbing flights of stairs with a sack of coal on her back. To the right of the woman, on the wall of the stair well, is a graffiti drawing of a head. On the floor are various stains. The graffiti and the dirt on the floor may indicate that this was not a very well to do apartment building, probably one occupied by working families. But note the electrical switch on the banister which indicates that even though the heat in this building was still using coal, the building had been modernized with electric lighting. Eventually the electricity would make the coal woman obsolete as more and more apartments switched to electric heat.